Microsoft apparently did not want to be retarded in the field of web technology, so no need to linger longer, bring Microsoft Silverlight Beta 4, which wanted to make it as a solution alternative to Adobe Flash that can be used by developers later. 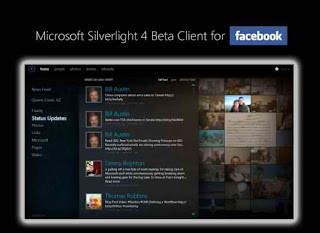 More precisely now been launched Microsoft Silverlight 4 Beta Client for Facebook. The application itself is reportedly took great advantage of capabilities introduced by Microsoft with the evolution of Silverlight. Of course, users will need Silverlight 4 to be try this Facebook application. "This application brings together a variety of capabilities Silverlight platform 4 into the browser application that is very familiar in the context of Facebook. You can enjoy photos, feeds, event, wall and inbox mail friend of a Facebook account using the platform that is very easy to use by the user, "explains the Microsoft. According to information accompanying the presence of Silverlight Beta 4 Client for Facebook, this project provide some new features in Silverlight that is: out-of-browser, hosting HTML content in an interactive, local access device (webcam), a rich-text controls, embedding media ( such as Youtube), desktop notification, COM integration (with Outlook) on Windows, right-click, drag-n-drop, the window controls and animations. Reportedly the Microsoft itself has launched the first Beta version of Silverlight 4 in mid-November of 2009 at the Professional Developers Conference 2009 in Los Angeles. However, now Silverlight 4 Beta is meant for developers already provided and is not accompanied by special license, which means that all content is made should be addressed as a testing only. "Silverlight is a client for Facebook application developers a preview for Silverlight 4. Where the latter when the final version of Silverlight 4 actually been resolved then you may be prompted to uninstall and re-install the plugin. "Added the Microsoft again.